With Manchester City losing 3-1 to Chelsea in stoppage time, Sergio Agüero apparently wasn’t ready to start taking things easy. With just a few minutes left, Agüero lunged for a truly dirty tackle into Chelsea’s David Luiz—which didn’t go over well, and so we got ourselves a fight. 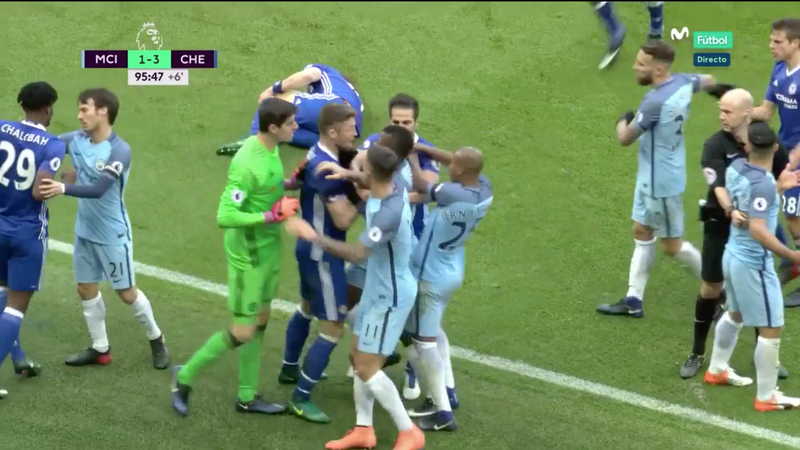 Highlights (or, perhaps, lowlights) included City’s Fernandinho grabbing Chelsea midfielder Cesc Fabregas by the throat and then pushing him over the advertising hoarding. Both Agüero and Fernandinho were given red cards. It’s the second of the season for Agüero, so this one will mean a four-game ban. And you may remember that this is not the first time that Agüero has lashed out at Luiz. How The Hell Did Alberto Moreno Get Away With This Tackle?